Homes at Shooting Star might look similar from the outside, but inside they showcase owners’ styles and lifestyles. This house immediately announces its modern aesthetic. 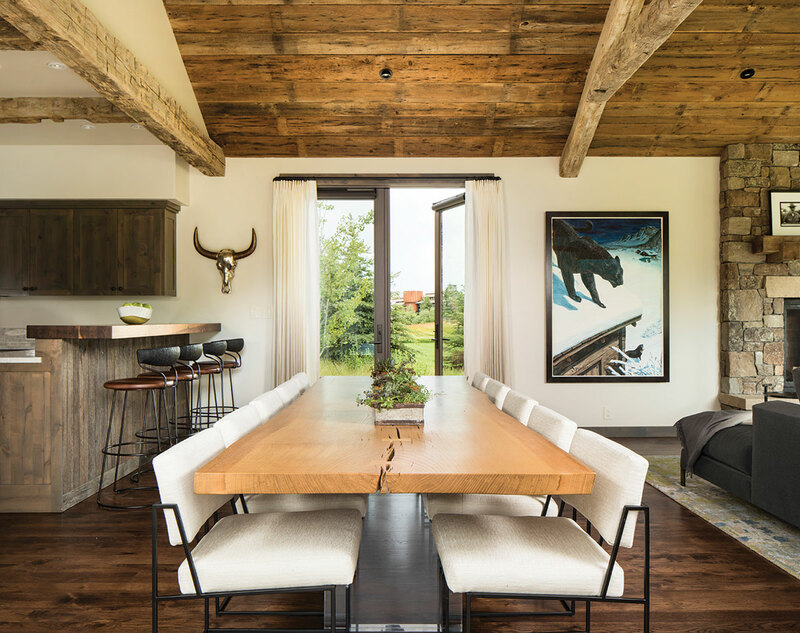 Its reclaimed barnwood front door opens to two contemporary benches (on either side of the door) made with brushed steel and reclaimed flamed oak along with custom bronze mirrors by Berman | Rosetti. While Shooting Star homes adhere to a uniform style and materials palette on the outside, inside anything can go. Jacque Jenkins-Stireman, the founder of Jacque Jenkins-Stireman Design and a member of Shooting Star’s design/development team, has done the interiors of about twelve homes here. In these, “There is such a broad range of design styles, every project takes on the personality and lifestyle of each client,” she says. And then there is the second Shooting Star home of a New York-based client. 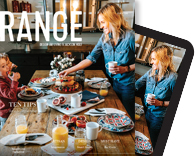 “We took modern, clean lines and incorporated a little organic, Mountain West local flavor,” Jenkins-Stireman says. The home, in Shooting Star’s North Cabins neighborhood, is contemporary and sophisticated. “I say this home is my Shooting Star showcase not only because it was recently finished, but because it’s so different,” she says. To date, Shooting Star has sold more than $200 million of real estate, and, even though the initial membership fee is in the six figures, as of last fall the only options left to become a member were to get on the waiting list or buy property. 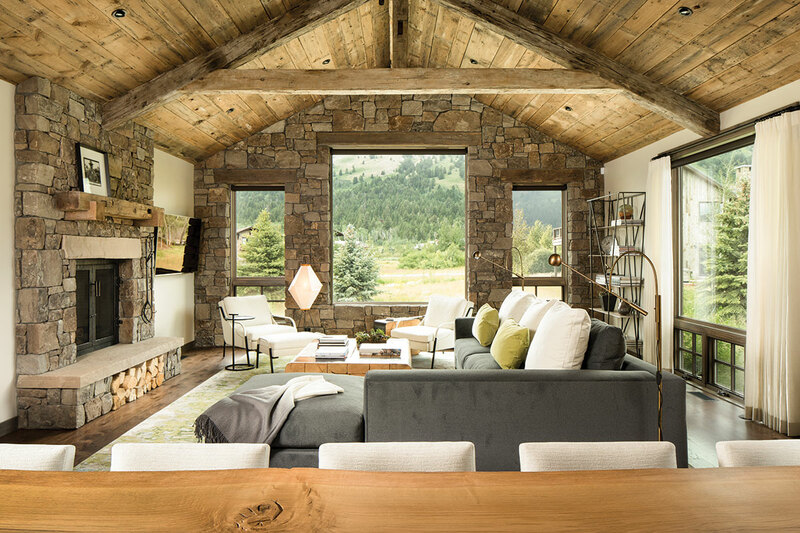 To achieve the contemporary, sophisticated feel of this home, Jenkins-Stireman designed custom furniture pieces. There is a table made of brass and oak and, in the master bedroom, an upholstered iron canopy bed. “I’m not a big fan of art above a bed, so I wanted to create a piece that’s a bit of art itself,” she says. “The headboard is higher than usual and has planks of upholstered Holly Hunt fabric, which keep the canopy open and create an artistic approach.” Throughout the home, colors are subtle and lines are clean. In this home Jenkins-Stireman wasn’t aiming merely to make the interior unique among the eleven other North Cabins; she also wanted to make it different from the client’s first Shooting Star home, for which she did the interiors about seven years ago. Jenkins-Stireman describes the older home, which is about 1,400 square feet smaller than the North Cabin, as “pretty edgy—it’s industrial modern with bold color and bold patterns in the fabric. It has a loft-like feel and a reverse living setup.” She says, “It’s a whole different feeling. [The owner] isn’t sure which one he likes more.” The plan was to use the second home and keep the first as a rental property, but early this summer Jenkins-Stireman says the owner “got an offer he couldn’t refuse” and sold the original home. It’s no wonder he got such an offer. As of late July, there were only two Shooting Star sites available, four single-family homes under construction for sale, and one resale cabin. Developed by the third generation of a family—the Resors—that has been ranching in the valley since the 1930s, Shooting Star opened its clubhouse and $29 million Tom Fazio-designed core golf course in 2009 at the beginning of the Great Recession, but has been successful from the start. In 2010, Golfweek named it the third-best new course in the country. Homeowners appreciate its 1,300 acres of open space protected by conservation easements. To the south and east is the Snake River Ranch, the Resors’ working cattle ranch. In the great room, most of the furniture is custom by Jacque Jenkins-Stireman. On the modern frame sectional she designed, Jenkins-Stireman used a Holly Hunt performance fabric. Her matching cocktail table and side table are the perfect blend of western and contemporary: binding stacked milled logs with steel. The rug is from Azadi Fine Rugs in downtown Jackson. This Lucite and Spanish oak dining table seats ten and is a collaboration between Jenkins-Stireman and L.A.-based furniture company Mimi London, which is celebrating its fortieth anniversary this year. Dining chairs are by Thayer Coggin. A painting by Walton Ford hangs next to the fireplace. 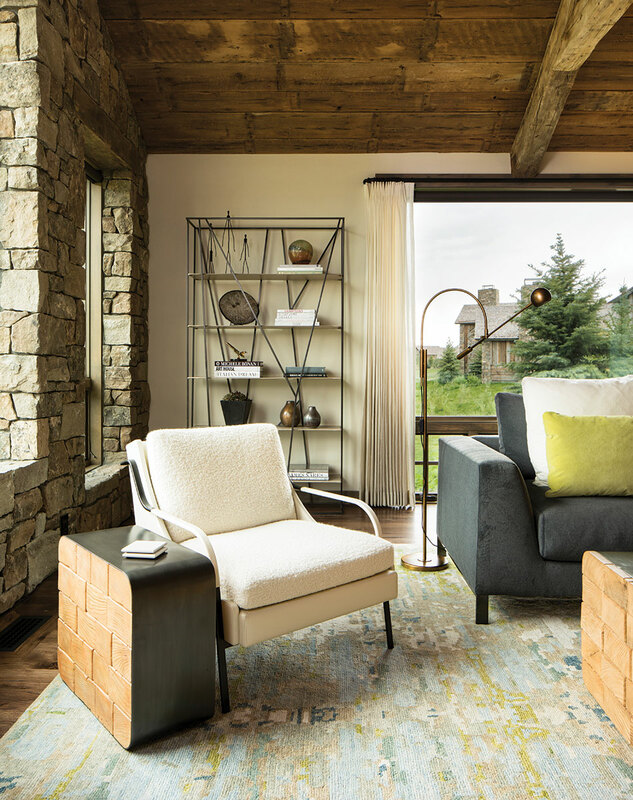 Jenkins-Stireman had a Holly Hunt chair upholstered with a Sandra Jordan alpaca fabric for the great room. In the media/bunk room, an Italian five-piece modular sectional sofa from Resource Furniture in New York City allows for both lounging and sleeping. The rift oak side tables and matching media console are custom designs by Jenkins-Stireman. 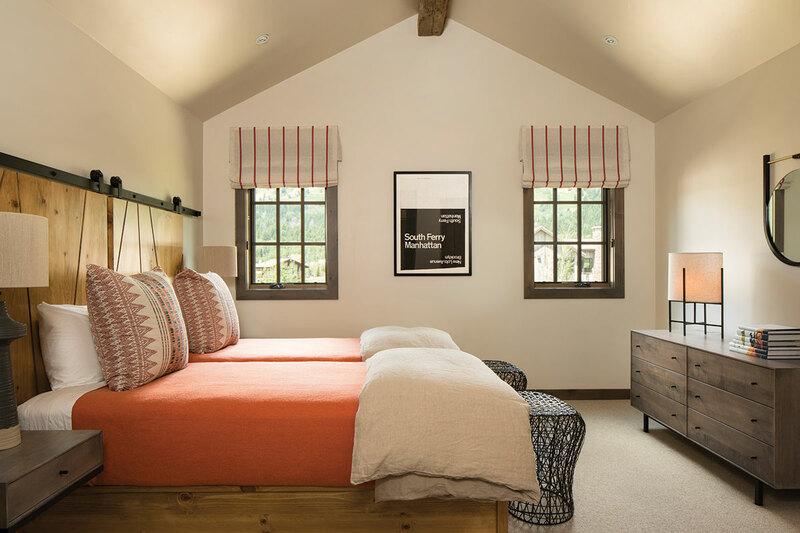 Jenkins-Stireman designed custom beds for this bedroom, which she calls the “king conversion sleeping room.” An iron barn track slide glides together (or apart) to convert extra-long twin beds into a king-size bed.